Semi-interesting find - There's collars & implanted gems in the Deer anim file. Cruel! Never been quite so sp00ked. Ever gonna update Winter is Here? Please? Not that many noticed it so I kinda stopped updating it. But I might post my idea for the caves in WisH, and a character you unlock inside of the caves. Please do! We'd all appreciate it - Would be really awesome to see your ideas realised, too. Wigfrid's quote changed - Incorrect now? "Die bravely, little foe!" is the new quote "Die bravely little foe! is the old quote. I think it was intended as "Die, bravely little foe!" 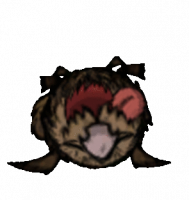 Potential Don't Starve character links. Let's say it all starts at Maxwell. Who/what does he lead to: Charlie (That's one character already linked.) - Charlie leads to Wigfrid and Winnie (See my recent posting.) Wagstaff (potentially his son, I will add more at the end) (If he becomes a character, that's two.) - Wagstaff leads to Webber, Maxwell's... Grandson? - He also leads to WX-78, actually being his creator. - He also leads to the Factory, and my next point. Jack Carter - Jack leads to Abigail and Wendy, Maxwell's nieces & his daughters. The Circus - The Circus leads to Wes, Wolfgang and Wilbur (Who is likely one of the monkeys from the monkey carriage noted in one of the puzzles.) The Factory - The Factory burned down, a weak link to Willow. Old Guy - Charlie mentions an old guy, a potential allusion to Wallace. Character list: Playable: Wilson - ? Willow - done Wolfgang - DONE Wendy - DONE WX-78 - DONE Wickerbottom - **done** Woodie - DONE Wes - DONE Maxwell - Well, he's kind of agiven. --RoG-- Webber - DONE Wigfrid - DONE --SW-- Walani - ? Warly - **done** - He worked on a Cruise ship in Jamaica, that potentially went into the Bermuda triangle? - It COULD be the boat Maxwell used? Wilbur - DONE Woodlegs - ? Non-playable (yet?) characters: Charlie - DONE Beefalo Trader - Nobody knows who he is, so he's not possible. Unimplemented characters: Wilton - ? Wortox - ? Winnie - DONE Wallace - **done** Waverly - ? **Pyro - ?, but he's non-canon. ** **Watricia - ?, but she was scrapped entirely. ** **Unknown SW Portrait - ? ** Not-yet-characters-in-any-way: Jack Carter - DONE Wagstaff - DONE Witherstone - DONE (He is directly in one of the Puzzles. Maxwell owes him a lotta money.) - I personally think he could be the one running the orphanage - But that is a personal hunch, and far from substantial. This leaves out Walani, Warly and Woodlegs, who I will chalk down to being part of SW (The unimplemented characters seem to already have a place in the lore, so Wilbur would fit.) It also leaves out Wickerbottom & Wilson - Sort of interesting how Wilson, the main character is left out. As for Wickerbottom, I suppose it's just a lack of info. If you have any issues with this, please reply with your ideas. Reasons for connecting Maxwell > Wagstaff > Webber Webber's comment on Maxwell's Chess Piece is "Reminds me of grandpa." - Theoretically, he knows him only as William Carter, which is why he would recognise the suit, and not Maxwell. All of his comments on his dad match Wagstaff, a factory owner who worked on precious Radios, and potentially WX-78 (PR-78 and WX-78. It's hardly a stretch, if you ask me :P) If we wanted to go for an extra weak link, Wagstaff's mother would have to be pretty old, making Wickerbottom the only candidate. All "done" in lowercase letters indicate a weak link. **done** indicates a pretty much non-existent link. Wow, that's a total of 28 characters, 26 of which could potentially be/are playable. That's pretty crazy. Willow's Lighter loses 1% on equip. The lighter loses 1% when equipped. This can be proven by spam equipping/dequipping, where it will break in mere seconds.